With health care costs and inflation soaring, it’s not abnormal for elderly Americans ages 65 and older to seek out divergent financial strategies on debt relief. As their conventional ideals of retirement and later life transform with time, the rate of older folks has spiked to nearly three times the rate in 1991. So what’s behind this trend? The path to retirement has been anything but even —from skyrocketing medical costs, endangered pensions, and insufficient investments have been mounting for decades. A New York Times study hints at elderly Americans’ novel task to unearth their own financial harmony as the country’s social blanket curls. Sadly, this bitter transition only spells trouble for the older generation, as hard-working Baby Boomers are forced to wait longer than expected for full Social Security benefits, forfeit more out-of-pocket health care expenses as the retirement age is raised yet again, and support the burden of mortgage and credit card debt into their “golden” years. To relieve the financial strain and reanimate the elation of retirement life, myriad elderly Americans are turning to bankruptcy. With Baby Boomers wrestling to secure a high-paying job, most folks have fewer years to suitably reestablish their wealth. Bankruptcy’s purpose is to present a “fresh start” by clearing overcoming debts or restructuring them to help the debtor pay them down with ease. Filing bankruptcy can also help preserve inheritance for a debtor’s children. Debt not yet discharged can destroy a legacy for forthcoming generations. Hence, consulting a dependable legal expert on your fiscal opportunities can save your funds for years to come. 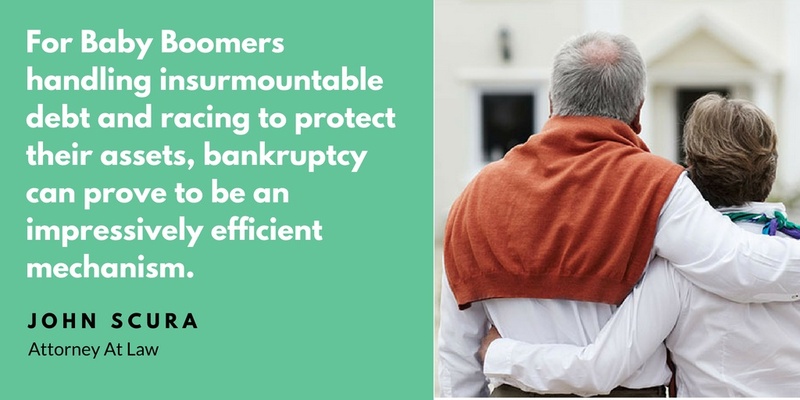 While it is normal for seniors to express trepidation over bankruptcy and if the option will further damage their financial state, this is far from the case. While debtors may see their credit scores dip subsequent to filing bankruptcy, we will encourage you to take certain steps to help restore it to former levels as swiftly as possible. The emphasis of our firm is bankruptcy and has been since 1972. Our trusted staff are committed to delivering the best possible advice to your unique situation. We will listen and understand why you came to us, then begin educating you on your options for debt relief and patiently answer any of your questions. Don’t hesitate to reach out to us at www.scura.com and schedule a free consultation with our legal professionals.